Safe, Sensible & Tactical Arrest Procedures for Law Enforcement Officers (LEO). Course Description - This intense and comprehensive three (3) day course is designed for law enforcement personnel that have or will have the responsibility of teaching proper/undated handcuffing techniques. The techniques presented are practical and effective. Topics to be covered include the safest approach and positioning for handcuffing, handcuffing resistive subjects, removing handcuffs, and the use of various type of cuffs, among others. Upon successful completion of the testing criteria, students will be certified as instructors, which allows them to train, certify, and recertify others in the Handcuffing Basic Course. NOTE: This is a hands-on course, and all trainees must be in good physical condition. All officers must bring a belt, handcuff case, quality handcuffs, & key. Proper dress for all three days - Wear comfortable loose clothing for physical activity I.e. BDU's/Sweatpants. Student Trainers will be provided with a course of instruction that will outline the full process of the course and how to deliver the material to their agency in different time allotment blocks for in-service training. A full CD of all lesson plan material, handouts, tests, sign in logs, lecture material and step by step procedures to the techniques is provided on the last day. Participant - This 3-day intensive workshop, in general, will have you performing subject control and handcuffing drills repetitively until you have gained the muscle memory of the process while assembling a lesson plan on your randomly selected tactical handcuffing subject for presentation (assisted by your partner) to the class on the third day. NO WEAPONS WILL BE ALLOWED INTO THE TRAINING ROOM !!! Wear comfortable loose clothing for physical activity I.e. BDU's/Sweatpants. Course Description - This four-day high demand course is for law enforcement personnel that are responsible for teaching proper defensive tactics techniques. Upon successful completion of this course, students will be certified to instruct basic handcuffing, subject control, self-defense, and weapon retention. The course will also include training in pressure point tactics, force and liability issues, and use of force reports. This is a hands-on course, and all trainees must be in good physical condition. There will be written and practical exams at the end of the course. PRE-REQUISITE RECOMMENDATION—-NOT REQUIRED: RECENT HANDCUFFING INSTRUCTOR COURSE (HCI) BY T.C. & R, LLC. Equipment needed: full duty belt, training gun optional, baton, handcuffs, and key. Dress code: BDU’s or sweats for described activity. HCI Refresher and Recert. will be done during this course (Cost: $150.00). This is a hands-on course, and all trainees must be in good physical condition. All officers must bring a duty rig, red or blue training gun, baton, belt, handcuff case, quality handcuffs, & key. Proper dress for all three days - Wear comfortable loose clothing for physical activity I.e. BDU's/Sweatpants. 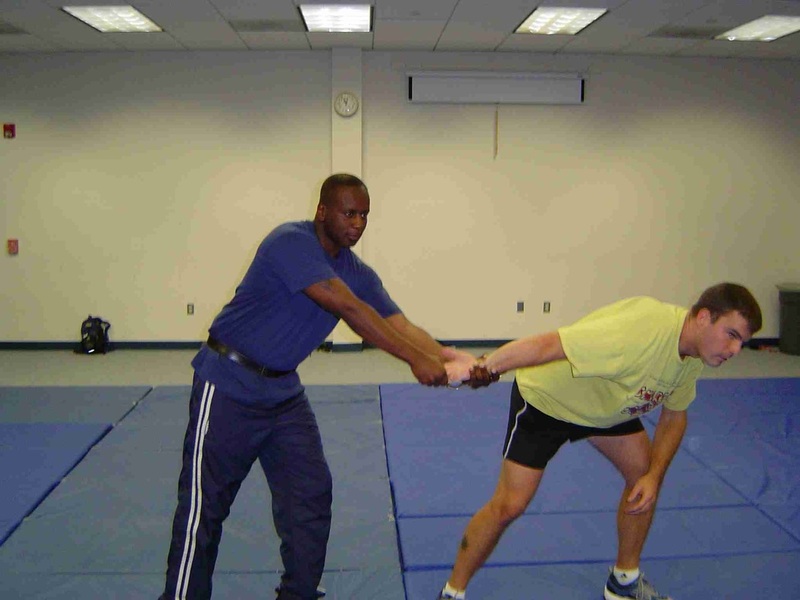 Participant - This 4-day intensive workshop, in general, will have you performing rolls, falls, break falls, defensive blocks & parries, entering & subject control w/ basic handcuffing drills. Assembling a lesson plan on your randomly selected defensive tactics subject for presentation (assisted by your partner) to the class on the third day. Course Description - This Defensive Tactics Instructor add-on program was developed for agencies desiring to train and certify departmental instructors in the use of techniques and tactics for defensive actions to prevent officers from being disarmed and/or held at gun point. This popular system is designed for law enforcement, corrections, and military. The objective of this course is to teach the officer effective responses to being disarmed and held at gun point in a close quarter environment or when their empty hands, firearms, and other use of force alternatives, are the only forms of self-defense. This course will cover realistic and effective responses highlighting the body mechanics needed to safely defend against an attempted disarming attack, prevent being disarmed through the practical drills of disarming persons in close proximity to officer and methods of prevention. Also addressed are the various angles of a weaponry attack, the knowledge of how an attackers use firearms, shanks and edged weapons against officers, dynamic movement tactics, limb control and stabilization techniques, disarming techniques, stunning tactics, alternatives and use of force options for patrol applications, and ground stabilization techniques. This course will include effective cycles of motion, zones of approach and escape when handling single and multiple suspects, in-service refresher points, dynamic confrontational exercises, including the discharge backdrop liability and laying the verbalization. Instruction is based on realistic use and applications of equipment in the use of force situation. This certification is valid for 2 calendar years from successfully completing this course. Equipment Required: Assigned duty belt with holster and training firearm if needed, groin protection recommended, issued impact weapon, handcuffs with key, gloves and anything else carried by officer relating to this topic. Participant - This 1-day workshop, in general, will have you performing weapon retention drills, weapon disarming as a last resort drills against blunt objects, sharp objects, pistols, long guns as well as using your issued weapon as an extension to your hand to hand close quarters combat tactics. Demonstrating that you can incorporate a weapons retention or weapons disarming drill into your current lesson plan format.